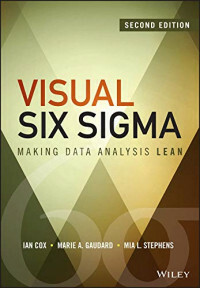 Visual Six Sigma provides the statistical techniques that help you get more information from your data. A unique emphasis on the visual allows you to take a more active role in data-driven decision making, so you can leverage your contextual knowledge to pose relevant questions and make more sound decisions. You'll learn dynamic visualization and exploratory data analysis techniques that help you identify occurrences and sources of variation, and the strategies and processes that make Six Sigma work for your organization. The Six Sigma strategy helps you identify and remove causes of defects and errors in manufacturing and business processes; the more pragmatic Visual approach opens the strategy beyond the realms of statisticians to provide value to all business leaders amid the growing need for more accessible quality management tools. Whether your work involves a Six Sigma improvement project, a design project, a data-mining inquiry, or a scientific study, this practical breakthrough guide equips you with the skills and understanding to get more from your data. With intuitive, easy-to-use tools and clear explanations, Visual Six Sigma is a roadmap to putting this strategy to work for your company.